I'm a sucker for gadgets and computer stuff. Just like the kids, I have to run out and get the new iPhone whether I need it or not. And I never go anywhere without the Macbook Air I'm using right now. I have no idea how I ever survived without a computer. The word processor literally changed my life. 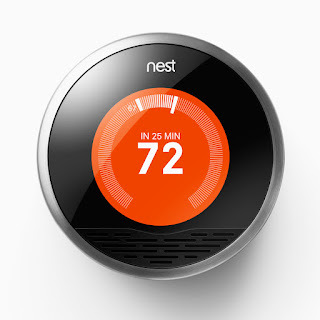 So when I got an offer to buy a Nest Thermostat from my gas supplier for a discounted price, I jumped on it. I mean, it's Santa Claus. It knows when you are sleeping, it knows when you're awake. You can adjust it from your cell phone. You can get one of those Amazon or Google things and give it verbal instructions. What more are you gonna want? Now I'm not what you'd call handy. We bought our house over twenty years ago and fixed everything ourselves, but I hated every minute of it. I'm like the father from A Christmas Story, cursing and complaining every moment he worked on that boiler. But I read the instructions and watched the YouTube video, and it looked pretty easy to install the thing, so I went ahead and did it. Only it didn't work. Every time I installed the base, the thermostat gave me a message that said, "Please install the base." It was maddening. I made unseemly noises. My little dog, against whom I've never lifted a finger, got frightened and ran upstairs to hide in my daughter's room. I listened for the click, heard the click, but the thing just would not work. So I took the whole thing down, packed it back in the box, and I'm gonna send it back. Then I replaced the old thermostat. One of the smart things the Nest instructions made me do was take a photograph of what the old wires looked like. I placed them just the way they were. It seemed like a complete waste of time, but at least it was over. Then this morning I got up and noticed how cold the house was. This was not good. But there was an emergency switch to turn of the gas, and I noticed I had left it off. I turned it on and it still didn't work. Now one thing I don't do when I'm in a rush to get to work is remove and reinstall a thermostat. Fortunately, my wife knows a great handyman who can come around and fix anything. His name is Juan. He's a great guy, but he only speaks Spanish. I can speak Spanish, but Juan's accent is such that it's hard for me to understand him. But that's not a problem, since my wife can call him. Except she can't. You see, Juan did some work for my wife's sister, and for some reason, he decided to take photographs of her. I can't specify as to why he made that decision, but I can tell you that when his wife saw said photos, she did not approve at all. So not only did she cut Juan off from my wife's sister, but she also cut him off from my wife. So my wife can't call him, because then his wife will know. I tried calling him myself, but my cell number is just one digit away from my wife's. it seems his wife has either noticed that, or knows I'm married to my wife, or something, so that's out too. So when my wife wants Juan to come and help us with something, she has to go to a friend's house. Now this friend has never been photographed by Juan, is not the sister of anyone who's been photographed by Juan, and is not married to the sister of anyone who's been photographed by Juan. Therefore she's OK. The problem is my wife has drawn jury duty in Nassau County today and won't be home. We're hoping they let her out early enough that she can get to her friend's house and call Juan. It's problematic because she'll have to wait for him to call back. In a pinch, I guess he can call her friend and her friend can give her the message. But I've learned my lesson and from now on I'm leaving home improvement to the professionals. I mean, me doing home improvement makes about as much sense as Juan coming in to teach my English class.